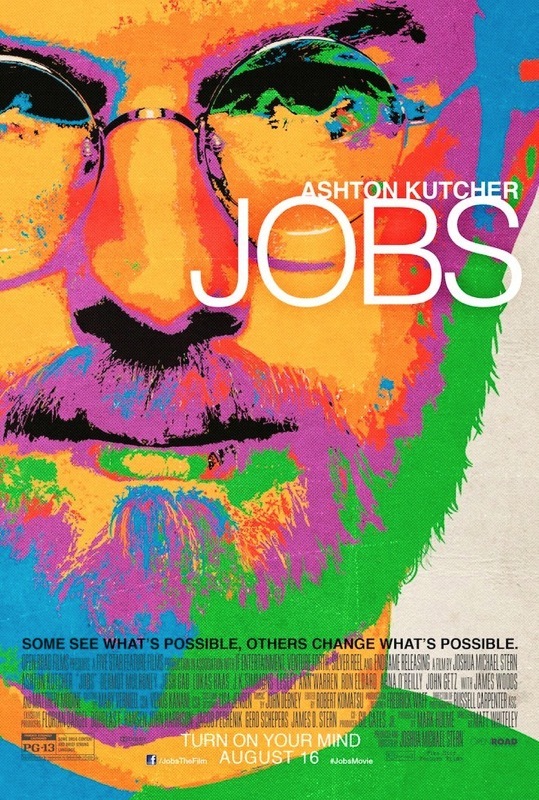 Moviefone has shared a new movie poster for the Ashton Kutcher's Jobs film. The poster features the tagline "Some see what's possible, others change what's possible." "Some see what's possible, others change what's possible" are the words sprawled across this exclusive poster for "Jobs," which features a nearly unrecognizable Ashton Kutcher. 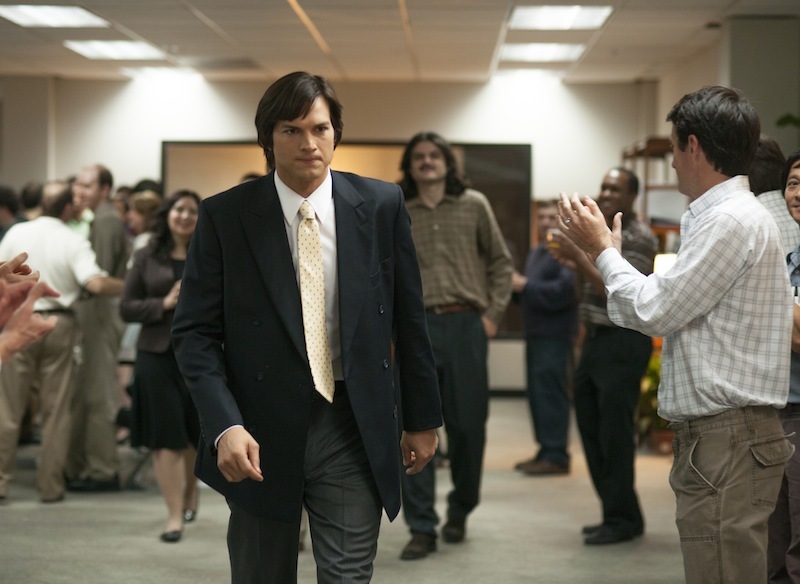 Kutcher is utterly transformed into late Apple co-founder Steve Jobs in the colorful new poster (below). Sporting Jobs's signature round-framed glasses and beard, the actor certainly looks the role. Jobs is set for an August 16th wide release. 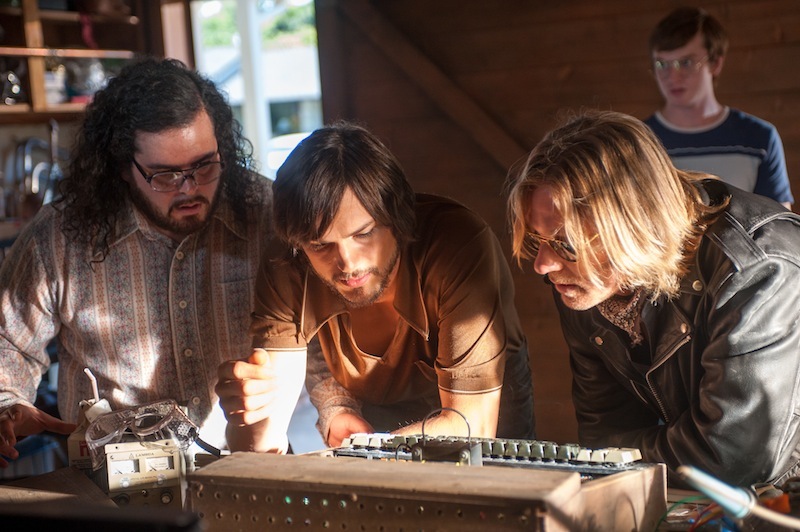 Update: Open Road Films has also released several new stills from the film showing Kutcher as Jobs and Josh Gad as Steve Wozniak. You gotta admit, Kutcher looks a lot like Steve. Not so sure about his acting skills though. I hope Ashton did a good Jobs. Transformed until he opens his mouth :p But I do hope this is a good movie and I'll go see it no matter what the reviews are. How many movies are there about the technology industry? Putting "Ashton Kutcher" there is an epic design failure, the irony. Who should they have put? Oh you're joking?....... you're joking, right? My first impressions of this film weren't high, but the recent trailer genuinely looks excellent. A well edited trailer can make anything appear interesting and a lot better than it actually is. From the looks of it, they did a haphazard job in pre-production and production. Now they are having to spend more on post-production and marketing in order to hide the fact that it's mediocre tripe with the main purpose of cashing in on Steve Jobs' death before the authorized film is released. I will be surprised if the final product is anything but movie of the week quality.